Review by Nathan Hinkle, Oct. 24, 2014, 6 a.m. I was quite impressed with the previous-generation Vis 180 when I reviewed it about a year ago, and the new 2014 model is very similar. The overall design remains the same: very sturdy construction using mostly metal and some durable plastic. A single bright, wide-angle red LED at the top, and a small amber side-visibility LED at the bottom. The output has been increased from 50 to 70 lumens, and the pulsing flash pattern has been modified slightly. If you already have a Vis 180 there's no pressing reason to upgrade, but if this is your first time looking at this light, read on for a detailed review. The Vis 180's optics exceed what its name implies: the light is visible from well over a 180° range. The high-intensity primary red light is behind a custom reflector that spreads the light evenly across the horizontal plane, without wasting too much light by shining it skyward. The output of the lower amber LED is split to each side, and is also very bright. 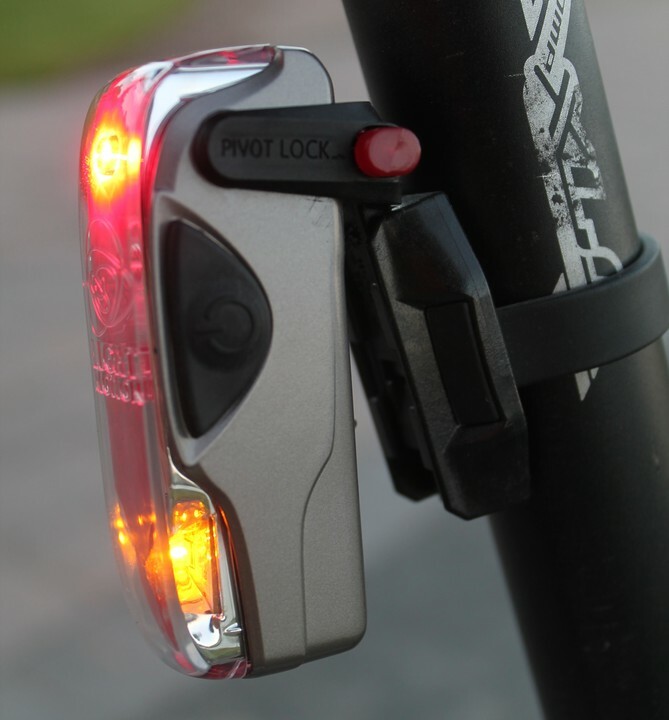 This combination makes the light visible from almost any angle behind or next to the bike. Many lights use a more focused beam, which improves long-distance visibility but only within a narrow beam. The Vis 180's wide swath of light ensures that you'll be seen regardless of whether overtaking vehicles are behind you, in a different lane, or on a corner. The light's 70 lumen output is enough that long-distance visibility is not compromised by the wide spread of light. The Vis 180 has four different modes. It offers a high-output (70 lumen) and low-output (25 lumen) pulse mode, a high-output non-flashing steady mode (70 lumen) and a low-power mode where only the small yellow LED blinks. The pulsing mode has been modified in the 2014 version – on previous Vis 180 releases, the light would pulsate quickly from full output to no output. The 2014 release has a slightly slower pulse rate, and doesn't ever turn all the way off, pulsing between full output and approximately 25% output. The videos below demonstrate the older pulse mode (left) and new pulse mode (right). The amber side LEDs also pulse now, rather than flashing on and off as in the old version. The new pulse mode is better for night riding in my opinion, because it ensures that there is always some light shining, and is easier to focus on to judge a rider's distance by. On the other hand, the old pulse mode is better for daytime riding because it provides more contrast against ambient light, and is somewhat more attention-grabbing. Light & Motion has been gradually rolling out pulse modes on all of their new lights, to avoid issues with flashing lights distracting drivers and other riders. I think in some cases they've taken this too far though. A rapid, full off/on pulse cycle like in the previous Vis 180 version is very attention grabbing without being distracting or disorienting. The new, subtler pulse mode is simply not as likely to grab attention, especially in broad daylight. Regardless of these criticisms, the Vis 180 still offers far better visibility than any other taillight on the market. No other light puts out so much light over such a wide view angle. The high output level is visible even in broad sunlight, and at night provides excellent visibility without offending those who are sensitive to strobing flashes. The Vis 180 uses an integrated rechargeable lithium battery. The output is regulated to ensure that brightness doesn't drop over time. On the steady-burn non-flashing mode, the light lasted for exactly 4 hours as advertised. After four hours, the main red LED turned off and the small yellow LED continued flashing for almost four more hours. 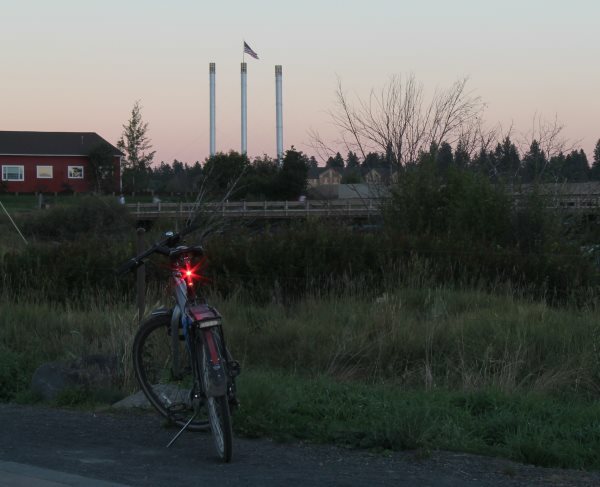 The yellow LED alone is not a legally adequate bike light in most jurisdictions because it's not red, but the light does have a built-in red reflector that may suffice in some places. Regardless, while the yellow light alone is better than nothing, for all practical purposes the light is dead after 4 hours. Like most lights these days, the Vis 180 recharges via a micro USB cable. The USB port is under a sturdy rubber cover on the left side of the light. The light does not run when plugged in; it must be turned off to charge. The battery status indicator LED on the bottom of the light is green at full charge, then changes to orange, red, and flashing red as the battery drains. When the light is charging the status indicator reverses the sequence until fully charged. This is the best battery indicator I've seen on any taillight, as it gives a clear indication of how soon the light needs to be charged. The Vis 180 has a very unique mount, and it takes a while to get the hang of using it. Once you get used to it though, it's one of the most sturdy taillight mounts available. On the bike, a rubber strap wraps around the seat post and holds a plastic mounting plate in place. The strap can be adjusted to nearly any post diameter and shape, including aero posts. The light body has a hinged mounting piece that slides into the mounting plate and locks into place. Pressing the red button on the right side of the light releases the hinge to rotate, letting the user align the light vertically. To unlock the light from the mount, press the red button in and swing the light all the way down until it presses into the mounting plate. Then slide out and up, removing the light. 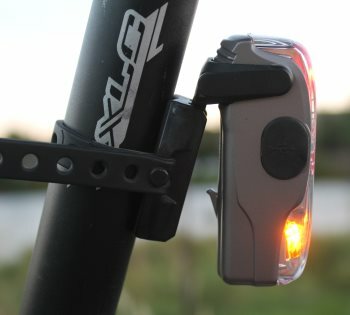 The mounting hinge on the light can also be used as a clip on clothes or a saddle bag. While unconventional, I like this design for several reasons. It's very secure – the light won't bump out of the mount no matter how rough the road. The angle is also locked in, so you don't have to worry about the light drooping towards the ground as happens with some mounts on rough terrain. The singular button is used to scroll through the different modes, with a single quick press to turn the light on and cycle through the four settings, and a press-and-hold to turn the light off. The button is easy to use, even with gloves on, and always registers a push. It's not clicky, but has enough travel that you can tell when it's depressed. 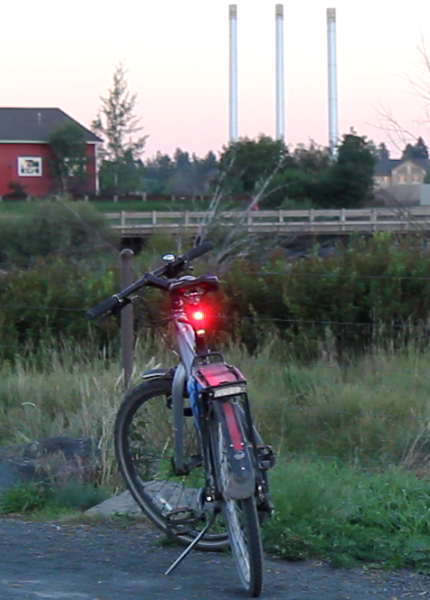 I often switch the light between flashing and solid mode while riding, and it's easy to reach behind and do that. A lot of people are shocked if you tell them your bike light costs $100 (even if they spend that much in a week to fuel their car! ), but the L&M Vis 180 is a great example of how "you get what you pay for." With the best all-around visibility of any taillight I've tested, the Vis 180 will keep you safe for any type of bike ride. The mount takes some getting used to, but ends up being a strong point of the light – there's no way it'll bounce out and get left behind like some lights are wont to do. 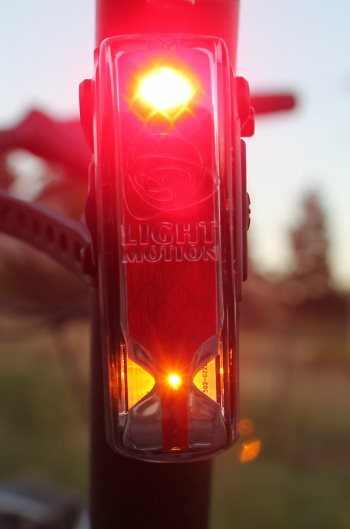 The light performs well, with battery life surpassing any other taillight in this output range. Attention to detail, like the easy-to-use button and the color-coded battery indicator reinforce that this is a premium product. Furthermore, the lights are built in California, USA, so your purchase supports domestic manufacturing. For those who simply can't afford to spend $100 on lights, there are still plenty of other options for excellent taillights. While I do think the Vis 180 is worth the cost, it truly is too expensive for many budget-conscious riders. Check out the full list of recommended taillights for other options, but if you're looking for the ultimate safety light, this light should be at the top of your list. Only one brightness level for solid-on mode (although pulse mode has a dimmer setting). Battery on my review unit stopped working after about 6 months, but was very quickly repaired for free under warranty (although I did have to pay shipping costs). I’m told this is an uncommon problem, and I haven’t seen any other reviews that had this same problem. Mount is not easily transferable between bikes, and only works on a seatpost (and only at certain angles). You cannot mount the light upside down, or on a seat stay, although there is a rack mount separately available. The rubber strap mounting mechanism does work for any post shape though. Expensive (at $100, you’re probably better off getting 2 or 3 other lights and putting them in different locations on different settings), but you definitely get your money’s worth for the light’s quality! Update: This review is for the 2012 version. We just received the 2014 Vis 180 to review, which has been upgraded to 70 lumens but is otherwise nearly identical. A full review with photos and more details will be posted after testing is complete.